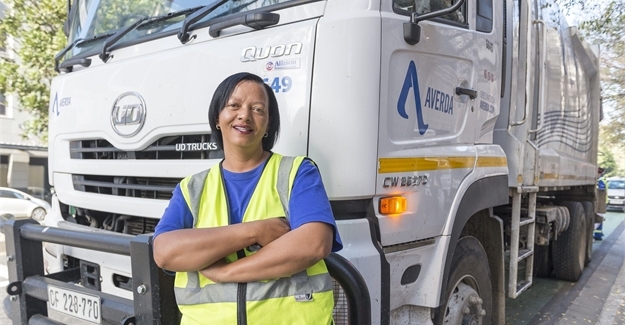 Global waste-management group, Averda, unlocks opportunities for emerging women truck drivers through its Professional Driver Learnership Programme (PDLP) as part of its drive to address a skills shortage of qualified and compliant heavy-duty vehicle drivers, particularly in the Western Cape. “In 2016, management made a conscious decision to change our recruitment strategy and to significantly increase our efforts to include female candidates in the company’s PDLP. The PDLP was established with two goals in mind: to upskill unemployed people and to address skills shortages in some of Averda’s operational areas. According to Rex, what initially started out as a pilot project ended up successfully destroying the myth that women would be suitable candidates for heavy duty vehicle drivers in the waste management environment. Collette Gobey, one of Averda’s recently appointed female heavy-duty vehicle drivers, says that even though she had always believed truck driving to be a man’s job, the prospect of being one of only a few women truck-drivers fascinated her. Averda’s PDLP was launched as a result of female interest in the industry and is aimed at developing skills to encourage more female heavy-duty truck-drivers in the industry. There are other benefits for companies, as drivers who have gone through the programme have proven to drive safer and more economically. Gobey says being part of this industry has forced her to grow a thick skin but has given her an immense sense of satisfaction, particularly since she is currently working with two other female drivers which she says had not been the case previously. Goby says part of what makes her job exciting is being able to be out on the open road every day, meeting new and interesting people along her route and having the feeling of freedom which is different to the experience you have when you are office bound all day. “It does bother me that people often don’t have patience for trucks on the road, but I see my job as one of great importance as keeping cities clean makes a significant difference in people’s lives,” says Goby. “As part of our ongoing driver training and assessments, we make use of qualified and experienced driver trainers that during one-on-one driving sessions assess and improve driver behaviour. We hope to make a contribution to the countries that we operate in by addressing a skills shortage with more qualified and compliant heavy-duty vehicle drivers,” says Rex. For the 2017 financial year, the PLDP should be able to make 20 qualified and compliant heavy-duty vehicle drivers, of which at least 7 positions (35%) will be dedicated female positions, available for deployment across the business. Averda intends recruiting unemployed women; providing in-house job specific training; deploying a crew to a dedicated female driver who will then take ownership of a vehicle, crew and a dedicated operational round. “By successfully breaking down the historical gender barriers, our female drivers have proven to be more than capable of providing the same operational services as their male counterparts,” says Rex. Averda is the country’s first multinational waste-management company, with dedicated engineering and design departments headquartered in London to oversee its high standards, delivery, longevity and credibility wherever it operates. Averda is a global integrated waste management company operating in 14 countries and employing more than 15 000 people. The company is known for operating in emerging markets where there is a need for an effective waste management solution, and runs successful operations in a number of African countries including Angola, Gabon and the DRC and Morocco.